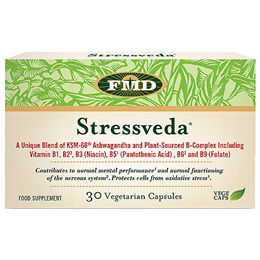 Stressveda® is a unique blend of KSM-66® ashwagandha combined with plant-sourced B Vitamins including B1, B2, B3, B5, B6 and Folate. Ideal for those with hectic lifestyles, this product can contribute to normal mental performance, normal functioning of the nervous system and, protects cells from oxidative stress. Ashwaganha (Withania somnifera) root extract, vegetarian capsule shell (hydroxypropylmethylcellulose), extract blend of Guava (Psidium guajava L.), Holy basil (Ociumum sanctum), Lemon (Citrus limon (L.) Osbeck), anit-caking agents (magnesium sales of fatty acids, silicon dioxide). Take 1 capsule daily. Do not exceed recommended intake. 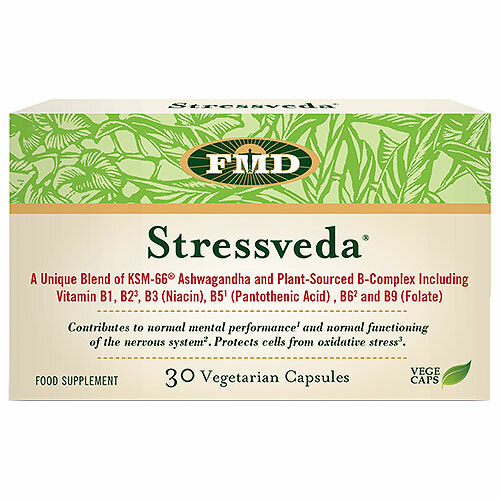 Below are reviews of FMD Stressveda - 30 Vegicaps by bodykind customers. If you have tried this product we'd love to hear what you think so please leave a review.